Before the day was out, six of members of the hit squad were lined up and machine-gunned on the very same spot. Calinescu was a conservative politician trying to fight off the rising fascist movement in his country — that aforesaid Iron Guard — and preferred to keep Romania in politic neutrality and friendly with England and France rather than hitching its fate to Nazi Germany. This entailed an increasingly acrimonious struggle throughout the 1930s against the fascists. Calinescu once called the Guard “an association of assassins,” and the prospect of taking a bullet from them can’t have been far from his mind. Calinescu’s fingerprints were all over press closures, pre-emptive arrests, and still worse offenses to outrage the far right. 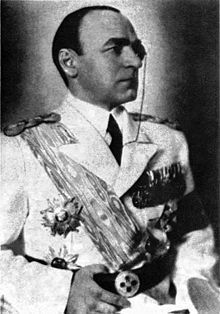 After years in the cabinet working hand-in-glove with the hated-by-fascists King Carol II, Calinescu finally became Prime Minister in March of 1939. Carol hoped he could be the bulwark against a Legionary takeover. If by his enemies ye may know a man, know that Calinescu was taken seriously enough for a multilateral meeting between representatives of the Iron Guard, fascist Italy, and Nazi Germany in order to make the arrangements for his murder. But Calinescu would probably have just as soon have preferred his life to this tribute of his foes. Nor was that the last exemplar. The “example” did not have the intended effect: in the span of another year, a fascist-aligned government had control of Bucharest and King Carol had hightailed it to Mexico, never to return. * The Iron Guard would pay back Argesanu a year later by killing him during the Jilava massacre of its political prisoners.